Squirrel hunting is sometimes being seen as a very easy task, but once you get through the field, you’ll be surprised how tricky it is! The squirrels are so small and tend to move fast! This is why it is essential that you purchase a pellet gun that is packed with features specifically for hunting squirrels. You don’t really need the most powerful and expensive one, you just have to choose the best one for your needs. When buying a gun, remember to always check on reviews and manuals before deciding that it is the right one. To make your task easier, we have provided in this reading the Top 5 Best Pellet Gun for Squirrel Hunting. Additional tips were also added to prevent injury or accident when handling the gun. More so, read on! 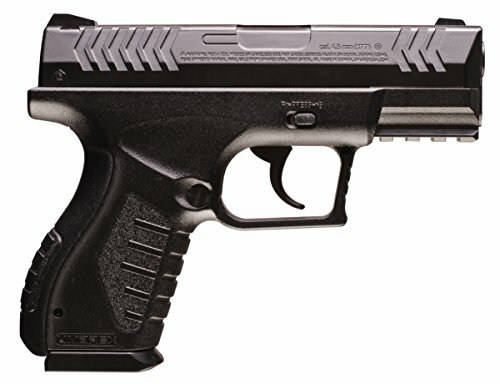 Choosing a pellet pistol gun can sometimes be hard given that you have an array of options available. How would you narrow down your choices? Well, the easier way to do it is to consult with long-time squirrel hunting enthusiasts, specifically those that use pellet pistols. By doing so, you’ll most likely get introduced to Gamo PT-85 Blowback Pellet Pistol Clampack. 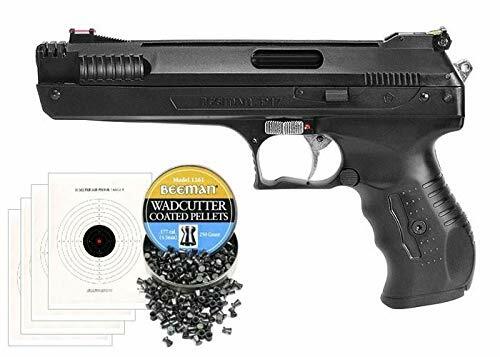 This pellet pistol is a semi-automatic model that has a highly-inventive blowback feature. 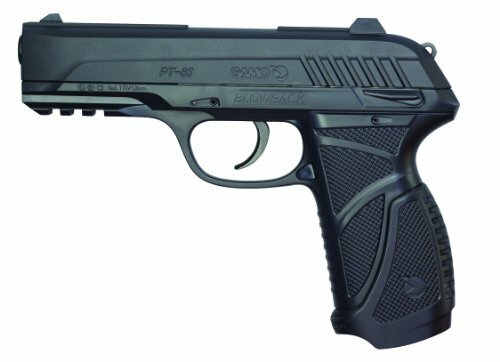 The Gamo PT-85 Blowback Pellet Pistol Clampack’ blowback system is the prime reason this model is highly recommended by many enthusiasts. It is because this system aids in easier and faster reloads which also work great in training yourself as well as familiarizing yourself with basic firearm rules before you proceed to a real one. Further, the pistol is operated by CO2 at an average of 450 FPS. It is also known to use platinum pellets that fires away impressively placed in 2 magazines capable of carrying 8 pellets each in a total of 16 pellets. Everytime you fire away, the barrel also does not require you to get hold of the pellets and break it open. It also does not require cocking each time you fire. Generally, its overall simplicity is very effective in small game hunting of squirrels especially for beginning levels. The Black Ops Junior Sniper is known as multi-pump pneumatic gun. It contains a pressure cylinder and a piston inside of it. Given that the gun is properly and tightly sealed, all the air that will be compressed when cocking goes directly inside its cylinder. At the same time, the cylinder contains a lock valve to ensure that the compressed air is safely kept inside. This pump-action gun is generally lightweight, compact, and with less recoil. It also contains a barrel that contains helical grooves. Meaning, the barrel allows the bullet to first spin inside before it finally leaves the barrel. This technique is very effective in adding stability to the pellets as well as improve its accuracy and shooting range for up to 30 yards. It also produces a very quiet sound that impresses many of its consumers. 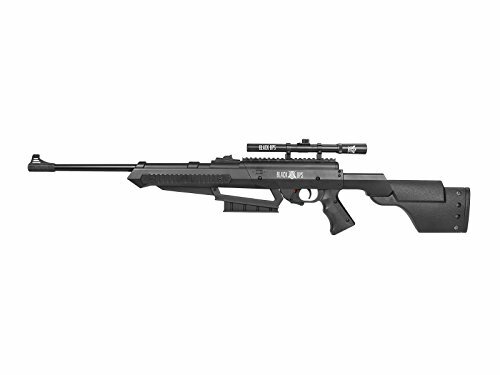 Whether it is for target shooting, plinking, or squirrel hunting, the Black Ops Junior Sniper Combo Air Rifle is definitely the best one to use. It requires little effort to maintain while still deliver hundreds of shots. The best part? It can be used by your kids as well due to its overall lightweight and easy functions. It even looks like a pellet gun and a BB gun combined in a single device! The Umarex XBG 45 CO2 is generally made with 8 to 9 pounds, featuring a medium to heavy trigger pull. However, given that this one is a double-action, this feature is expected from it. It has also a very compact design that will definitely be comfortably with your hand even for a long hours of use. It also contains non-slip grip that keeps your grasp secure. Generally, it is lightweight making it applicable to practice with, carry along, and store. Further, the Umarex XBG 45 CO2 has also been noted to be great in shots in its CO2 capacity, general accuracy, as well as FPS performance upon multiple tests. Besides, it can also penetrate through barks and woods even if you are 40 feet away from it. Its realistic action on the magazine and the double action firing response makes it extremely attractive. Further, the Umarex XBG is also made with plastic shells that are durable enough to maintain its functions. That said, this model is rich with efficiency and simplicity in its operation which makes it extremely reliable. Whether you are a beginner or a professional squirrel hunter, you will still find this product as easy to use and handle. With enough practice, this gun will also provide you the most productive hunt you wish to have! WEIGHT: 1.7 lbs. ; OVERALL LENGTH: 9.5", BARREL LENGTH: 4.5"
The Beeman P17 Pellet Pistol is formerly known as the Marksman 2004. It is a German-designed single-stroke that is noted with impressive velocity and accuracy. Only with a single shot, this pistol can deliver it with up to 410 FPS with no total recoil and CO2 requirement. Its trigger even provides minimum take up. Further, the pistol contains a custom-shaped, finger grip which allows you to shoot with full comfort. This comfortable grip is also believed to provide you with better accuracy. Indeed, the shot will be directed to the squirrel targets! It also contains a polymer frame that is so lightweight and durable. Its slide is also made with high quality aluminum and barrel that are all-steel. 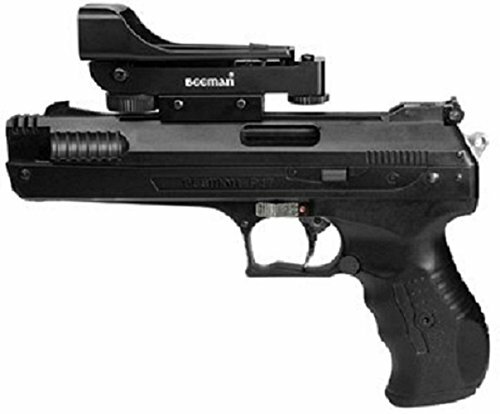 This allows the Beeman P17 Pellet Pistol to have a long life and outstanding accuracy in the field. Along with the product, the package also contains a manual with safety precautions, a set of rear sights that are both adjustable for elevation and windage. The price remains unbeatable! It has an impressive accuracy that is at a very low cost. The trigger is also contains a very amazing light and crisp trigger. Everyone even feel the surprise of every shot may it be for plinking, target shooting, or hunting. Among pistol pellets, the Beeman always remain on top of them. If you are searching for a unique spring-piston for your squirrel game, the RWS .22 350 Magnum Air Rifle is the best one to use. It is also an effective device to use when you try to eliminate the pests in the neighborhood, plink around, as well as shoot through field targets. This is because the device is strongly made with all-around performance, power, and beauty. With just a minimum care, this product can also last for years more than you expected. Generally, the springers are used by some hunters who just prefer this gun style. It creates a greater recoil, heft, and noise that require you to adjust a little if you are used to the typical ones. However, only with little practice, you can now already face its challenging features. Most enthusiasts suggest that you hold it using the artillery method, where the gun is lightly held, to make use of its impressive accuracy doing 50 yards consistently! 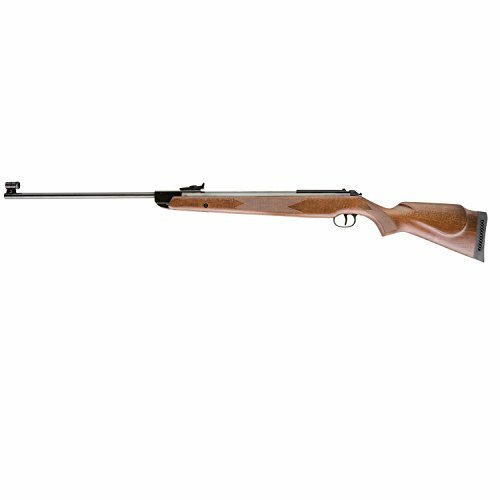 Overall, RWS .22 350 Magnum Air Rifle is a very powerful gun for your squirrel hunting. Although it is tough to handle for the first time, it will surely gets smoother as you get used to it. Nevertheless, this product is not the advisable rifle for young people and other female users with small physique. POWER SUPPLY: The CO2 depends entirely on the warmth of temperatures. Given that case, CO2-powered pellet guns may be problematic when used during cold seasons. If you live in cold places or even cold season is approaching, you might just avoid buying a CO2-powered pellet gun. DISTANCE: The pellet gun must also hit the squirrel targets even for far ranges. This means that if you do not want to get close to the squirrels, consider buying the pellet guns that are reliable when it comes to shooting range. POWER. For a small game, like squirrel hunt, you need a squirrel hunting that is 8 pounds of energy at target. In this case, increased game size also requires an increase in the amount and quality of power you need. Practicing with your pellet gun is the best way to achieve impressive accuracy and velocity. It is also vital in keeping your hunt productive for the best meat in dinnertime. Most times, enthusiasts and beginners use a variety of pellets before they found the right one for their needs. The two types of pellets that are commonly used are the domed pellets and wadcutter pellets. Using a scope can allow you to hit desired target whether it is far or near. It makes a better accuracy in shooting the squirrel in your desired part or location. Take advantage of the paths like dried creek beds, woods, ane logging lanes as natural paths make the best squirrels’ places to chill. Track squirrel foods while hunting - this could be some acorns, soybeans, and beechnuts. They might just be staying nearby. Stalk on squirrels in places you cannot be seen - this includes haystack, behind the trees, big rocks, and other tall plants. If you are hunting during late fall, some coverings like plants big leaves will cover you not being seen by the squirrels. After hunting, do not forget to wipe down your gun and properly clean it in order to avoid rusty metal. Prioritize removing moisture and fingerprints as well as this may irritate you once you use your gun again. At the same time, this moist can easily ruin your gun’s finish. When cleaning, always bear in mind that natural and non-harsh chemicals can be used as a gun cleaner. Other chemical-rich firearm solvents can negatively affect your gun’s functions. It also deteriorates the gun’s seals and rings. When it comes to dealing with squirrels, you need something which functions high in accuracy and kill force up to a decent range. The Gamo PT-85 Blowback Pellet Pistol Clampack is the perfect model both for your plinking activity, target shooting, and squirrel hunting. It is very affordable for those who are in beginning and professional level. Generally, its comfort, weight and appearance make the whole firearm look like a high-end gun. Further, its blowback system is the prime reason this model is highly recommended by many enthusiasts. It is because this system aids in easier and faster reloads which also work great in training yourself as well as familiarizing yourself with basic firearm rules before you proceed to a real one. Hence, if you are looking for a gun that will benefit your squirrel hunting game, the search is over as you found this model. However, whether you have chosen this gun or not, the best thing to do is to go to the woods and try out whatever gun you purchased! Bring with you the exceptional skill on speed, agility, and sharpness of vision. At the same time, do it on purpose - either you just want to control squirrel pesting or you want a good meal time, you should feel good with this sport!